Got to know about this great SEO tool after I was contacted by Joseph Bamber to have a look at it. I reviewed it some time back but forgot to blog about it. 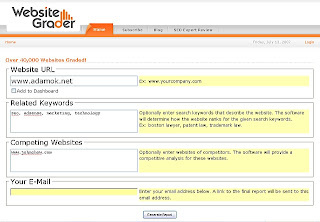 The Website Grader is a Free SEO tool, which can be used to find out your website's marketing effectiveness. 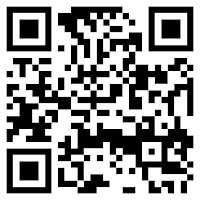 All you have to do is type in your Website URL and hit the submit button. You can also add 'Related Keywords', 'Competing Websites' and your email. All these are totally optional but I recommend you do so in order to obtain a more useful and detailed report. For example, I put John Chow in the 'Competing Websites' space for comparison purposes. I used this site for reference and learnt a great deal. 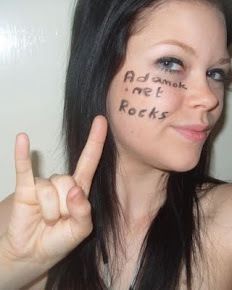 First of all I learnt that the WebSite Grade For www.adamok.net is 79/100 (Friday, July 13, 2007). This means that my site scores higher than 79% of the thousands of websites that have previously been submitted to the tool. It also give me the Google Page Rank, Alexa Rank, Technorati Rank, Google Inbound Links, Yahoo Inbound Links, Delicious Saved Count and Google Indexed Pages. Previously I had to use different tools to tell me all of this. it is possible that you are diluting the effect of your most important keywords. I even received a digg.com submission summary that told me that I have had 10 articles submitted to digg.com from this site. These articles received a total of 26 diggs (votes). Unfortunately, none of these articles have made it to the front page of digg.com. In order to access more features, you need to register with the site. This tool is amazing. I simply can't believe that it is free. Try it out to see for yourself.